CHESS, CHESS PROBLEM, STUDY, COMPOSER, SOLVER, PROBLEMIST, THEME, KEY, TASK, FAIRY, HELPMATE, SELFMATE, UNIQUENESS, ECONOMY, BEAUTY, ART, WITH A SPECIAL INTEREST FOR GREECE. Mr. Pavlos Moutecidis is International Master (IM) in composition of chess problems. He was born at the city of Drama in northern Greece, in 11-11-1930. He graduated as Civil Engineer from the National Technical University of Thessaloniki Greece and worked in this occupation until he was retired. He is married, he has three daughters, and he lives in Thessaloniki (Salonica) Greece. He learned chess at the age of ten and met the chess problems at the age of nineteen, in the newspaper chess columns edited by Spyros Bikos. When Moutecidis settled in Thessaloniki, he found great help for his first steps by Triantafyllos Siaperas and he started in 1953 to compose mainly orthodox direct-mate problems. After a while he was excited with Selfmates and for a long time he composed only selfmate two-movers. After studying the works of Ilja Mikan and Jan Rusek, he turned to the more-movers. His correspondence with Albert Kniest motivated him to create Maximummer problems. Near the end of the seventies, under the influence and guidance of Demetrio Gussopulo, he joined the world of Helpmate problems. During the period 1967 – 1975 Moutecidis has published many successful compositions in cooperation with Evgeny Sorokin. Moutecidis is an exceptionally productive composer and he has published about 3000 problems. In 1984, FIDE awarded to Pavlos Moutecidis the title of the International Master in Composition. He believes that his point of view for a good problem is rather “old-fashioned”. Beyond the originality, which gradually becomes more difficult to achieve, the economy of the pieces is of utmost importance for him. By his opinion, in a successful composition all the pieces should be used organically (in other words, pieces should have more than one roles) and maybe this is the reason why he prefers more-movers with a few pieces. in which 37 composers from 17 countries participated with 86 problems. (This shows that Moutecidis is very respected in the world of Chess problems). Moutecidis is very energetic. In the 50th World Congress of Chess Composition, held in Rhodes Greece in 2007, he was judge of the Metaxa Tourney. We have presented compositions by Pavlos Moutecidis, (the problems 011 and 126, 013 and 153), let us see a recent one. In a contest to honor Diyan Kostadinov in 2007 at Burgas of Bulgaria, the following Moutecidis's composition was awarded with second commendation. (There is set play). Selfmate in 8 moves. It is obvious that the mate will be delivered by the black Bishop, since the forces of Black are minimal. The difficulty is that White must play first, and the plan is to bring the same position with Black to play. 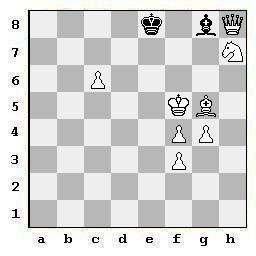 White will use the triangle of the white King (Kf5 – f6 – g6 – f5) to lose a tempo, since the black King can only move in a linear manner (Ke8 – f7 – e8, or Ke8 – d8 – e8) and it is impossible to move in a triangle. For controlling the Bishop, White will use check and pinning. (The plan has been applied. Same position, but it is Black's turn to play. Zugzwang). When a piece leaves a square-X, then visits only another square-Y, and returns to the square-X, we have a switchback of the piece. When a piece leaves a square, then visits at least two other squares, and finally returns to the initial square, we have a circuit of the piece. Special case of the circuit is the triangle of the King. Circuit 3___: wKf5 - f6 - g6 - f5 (triangle of the wK). (This post in Greek language). Thanks for making us know this excellent composer. I wonder, what is the purpose of wPf3? If you ask Google about 'Kostadinov - 25 J T' you will find the initial award and the final award, after they found that First Prize problem was anticipated. Every day the website www.shredderchess.com offers to the readers of the blogs three easy chess exercises. They are given in three levels of difficulty, (L1, L2, and L3), and you may give the solution by moving the pieces with the mouse pointer. Below the diagram is then shown if the answer is correct or not. READ THIS BLOG AS A TEXTBOOK, STARTING FROM (23-03-2008) Hello AND CONTINUING WITH EVERY [NEWER POST]. THE COMMENTS ARE USEFUL (AND WELCOMED). SOLVE THE PROBLEMS, STUDY THE SOLUTIONS, ASK US ABOUT ANYTHING INTERESTS YOU IN RELATION WITH COMPOSITION AND SOLVING OF CHESS PROBLEMS.